Already, Ms Allan says there won’t be new platforms at South Yarra despite the huge residential and office growth in the past decade. The mostly unfunded Melbourne Metro is grossly deficient before a tunnel sod has been turned. Edmund Carew (Letters, 7/8), I hear you loud and clear. 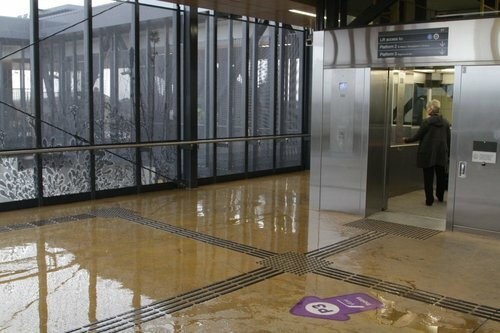 The new West Footscray station is a huge monolith that is so badly designed that even the “covered” walkways and platform don’t provide shelter from the rain. Most people huddle near the myki machines to get respite from the cold, wind and rain. It beggars belief that someone was paid big bucks to design this thing and yet not one single person in the whole process thought about appropriate shelter for commuters. Epic fail. At least you got a platform, Edmund Carew. On the 86 tram route on Smith Street in Collingwood, a single seat has been installed at a stop. In the streets surrounding this lonely perch, 3000 apartments are due for completion in the next year, and who knows how many more after that. Not to mention those already built. The mind boggles. 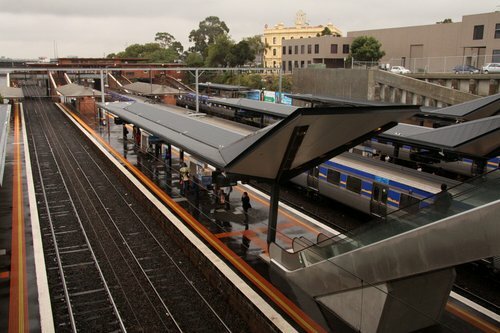 North Melbourne railway station was upgraded in 2009, and is an early example of Melbourne’s trend towards architectural wankery trumping weather protection – the new concourse is high up in the air, with nothing to prevent windblown rain from drenching waiting passengers. A year later a brand new footbridge at Footscray opened – while it features both a roof and wall, both are studded with holes that let water in every time it rains, earning it the ‘colander bridge‘ nickname among locals. However the project team didn’t learn much from their work at Footscray – the new overhead concourse at Sunshine station has a roof, but no walls! Hopefully those building our railway stations charge will work it out with their next upgrade project! 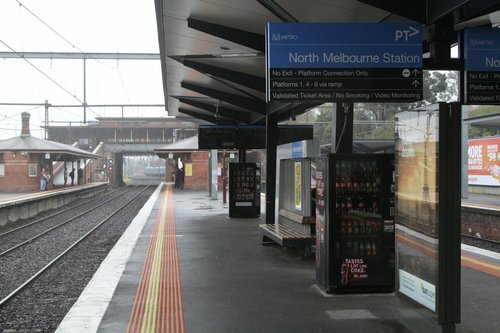 Welcome to North Melbourne station – the modern verandas at the city end do nothing to shelter waiting passengers. But walk 50 metres to the heritage listed end of the platform, and the original verandas keep you bone dry. It sure takes some skill to take something that works, and build something next door that doesn’t! Good piece Marcus. I tweeted the same thing to Daniel Bowen prior to all these comments came out. They have just finished one at Watsonia, and it is laughably ordinary. Way too high, and way too shallow. On a rainy day you see the poor people huddled together in the one pissy area that remains dry. The station house, built in the boring 70s or perhaps 80s covers people perfectly though. The term “architectural wankery” absolutely cracked me up, and is absolutely right. I hear you on this subject. We have had similar recent conversation at work. The new Ringwood station currently under construction is crap to say the least with the new sheltering. In fact all the new stations such as Nunawading and Blackburn the same issues. We also said the same thing the heritage roofing was great so if it aint broke don’t fix it. Also on a similar problem what the hell happened to proper track maintenance and platform height alignment with trains (platforms are all at fixed height, trains are gauged at factory for correct height, track height is based on the amount of ballast. New tracks are being built all over and often the result is worse than it was in that the carriages are almost hoping sections and are swaying hard left to right. In addition I noticed people having to take a step onto the train at Richmond (and a few other stations) almost a foot in height. This is really dangerous stuff and what are they doing to fix the problems? and why did they create the issues in the first place? Platform height is a joke – apparently there *are* standards, but old platforms don’t necessarily conform to them. Not to mention that the Siemens trains have a higher floor height than the rest of the fleet, so that even stations with ‘level’ wheelchair ramps require a step up into the train! First is vandal resistance. The higher a roof is, the less likely that anything hanging from it (PIDS, signage, etc) will be within reach of vandals. The population is getting taller (we all know someone 2m tall, or 6’8″ in the old money – that wasn’t true in my parents’ generation) so staying out of reach is harder. Second is maintenance. Old station weather shelters seem to spring leaks at every opportunity, and that tends to increase with the amount of rain water they catch – especially if it’s left pooling in indentations in the surface. Plus, blocked gutters mean water overflows onto whatever’s underneath, so they came up with the idea of a V shaped roof with the gutter in the middle, so it doesn’t drip on people as they get onto the train. Who knows, clearance around 1500V wires might have had an influence too. They’re both good reasons, but nobody has put two and two together and worked out that deterring vandals and avoiding problems caused by lack of maintenance aren’t goals in themselves – the goal is to make a station functional and comfortable for passengers. And the measures they’re using to try to ensure that are actually doing the opposite! Our rail industry tends to live by prescriptive rules, rather like the road industry did about 15 years ago. The road industry has transitioned to descriptive rules – so instead of saying “A semi-trailer must have three axles at X spacing, centred Y meters from the king pin”, they say “A semi-trailer must be able to make a turn in a standard arterial road without any part of its body protruding outside the swept path Z”. If the rail industry did that it would have rules like “Stations must have X square meters of standing space which will remain dry in a once-in-a-year rain storm including Y km/h winds”, and force the designers to think about the passengers rather than their artistic flair. I’ve noticed it too and would say it’s the failure of form to follow function with modern architecture. Similar to station shelters are those trendy new shop awnings they’ve installed at Myer Bourke Street, on the former Myer House, now Somerset Apartment building and on The Emporium on Lonsdale Street – all minimalist glass and narrow. Look nicer than their 1950’s/60’s/70’s predecessors but unfortunately are completely useless in terms of sheltering pedestrians from the elements. I think Michael Angelico may be at least partly right, in that there are some reasons why they are the way thay are, but they still miss the point marcus is making that they dont actually serve their purpose ! I rekon there is a lot of wankery. After all the 1950s richmond station has sloping up roofs and still manages to keep the rain off (though the exposed position makes it pretty bloody cold and windy). I noticed the other day there’s some new canopy that almost matches the old filling in the gaps, so it obviously can be done at a lower, more useful, height. I think there’s also some kind of over-engineering going on; all the new structures are made of such huge thick steel sections, if not concrete, and thick roof section – just looks so unnecessary compared to the delicate 19th century stuff. Maybe its about safety standards ? Maybe regulations have changed ? In case of fast trains ? In case of accidents ? So it will last 100 years ? (though the cast-iron have verandahs have lasted up to 130 years in some cases..). Isn’t it called style over substance? Yet there is not really much style or elegance either. Next post, Melbourne’s deficient tram shelters, not quite as bad as new station shelters, but there are some pretty crook ones. The reason why they have gone for roofs sloping away from the track, rather than towards it, is so that anything that lands on them rolls away from the track, rather than towards it. The decision was, I believe, made at the same time as deciding new platforms will slope away from the tracks rather than towards (but old platforms are still sloped towards the tracks and so every so often a pram rolls onto the track). 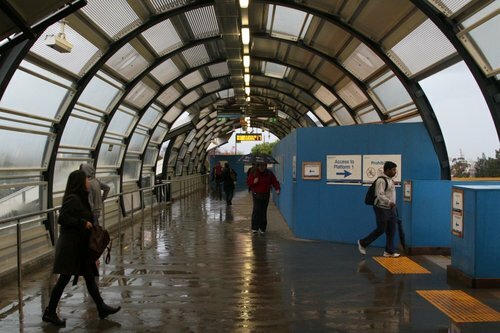 The new shelter at Richmond is welcome but everybody involved in approving the prison bars design of the city end ramp shelters should no longer be involved in station design. Narrowing the ramps was not the best either. I suspect that the ramp shelters could have been built with supports on the outside of the ramp walls rather than the insides. 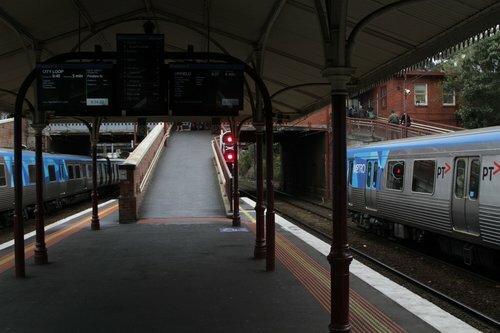 South Yarra needs a new concourse near the city end of the platform to allow Melbourne High, Forrest Hill precinct and many interchanging passengers to avoid the congested Toorak Rd entrance. It could also potentially have access to Darling St for passengers from that part of South Yarra. Think of the yellow stick on CityLink or the 2 pillars straddling Bolte Bridge which I think serve no engineering purpose whatsoever. Arts graduates are allowed to design whatever they want and government funds it. Myki is the same thing: “we must reinvent the wheel” at taxpayers expense. As for graffiti vandals. Jail the bastards. In Singapore they literally cane you for that and guess what Americans/Europeans say when they get caught. “I did not know the punishment for graffiti is that severe, please do not cane me”. @jacob, the yellow stick thingy is “supposed” to be art, not useful. Whether you personally like it, or not, is entirely debateable, but it is not supposed to be “useful”. Canopies over the stairs at railway stations, on the other hand, actually are supposed to be useful. That’s the big difference. I think that these structures should be prominently emblazoned with the names of the world-class wankers who designed them. Not to mention narrow platforms at the bottom of a concrete pit aren’t exactly passenger friendly. Why doesn’t they provide a wider island platform instead?